A while ago, I developed an Excel-based spreadsheet, StencilCoach™, that calculates optimal stencil aperture parameters for several common SMT solder paste printing applications. 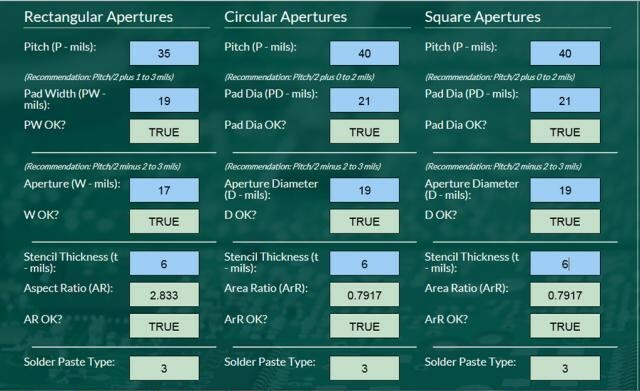 These applications include Standard Apertures, Passive Apertures, Pin-in-Paste (PiP) Apertures, and Preforms with Pin-in-Paste (PiP+) apertures. These algorithms are now online at http://software.indium.com/. Over the next several posts, I will review the use of this software tool. Let’s first look at standard apertures. After logging into to the website, click on “Stencil Coach” and then “Standard Apertures”. The page gives the definitions for “Aspect Ratio” for a rectangular aperture and “Area Ratio” for circular and square apertures. The aspect ratio, which is defined as the width of the rectangular aperture divided by the stencil thickness, should be greater than 1.5. Whereas the area ratio, for circular or square apertures, is given as the area of the opening divided by the area of the sidewalls. This formula simplifies to D/4t, where D is the diameter of a circular aperture or the width of the square aperture. The area ratio should be greater than 0.66. These recommendations are not standards, but are good rules of thumb. Let’s consider a situation where a PWB has rectangular apertures with a pitch of 35 mils and circular and square apertures with pitches of 40 mils each. The stencil thickness is 6 mils. See if you can develop the pad and aperture sizes and reproduce the figure below. Hopefully this tool will help you design your stencils. PS: If you need a hand, feel free to contact me at rlasky at indium com.